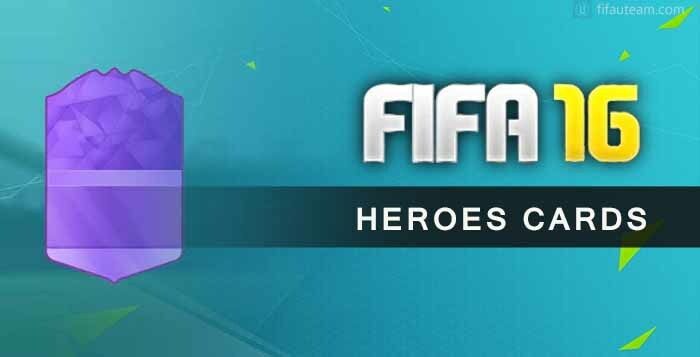 The Heroes cards were created in FIFA 15 Ultimate Team to reward individual honours, like best players and best young players awards, and heroic contribution during an important match such as a league derby, winning promotion to a higher league, or saving his club from relegation. The ratings and attributes of purple cards are usually boosted in one or two points, compared with their last TOTW / MOTM card or, if it doesn’t exist, their regular card. However, they are always worse than TOTS and TOTY cards. Just like MOTM cards, these ones become available in packs for only 24 hours, usually at around midnight (UK time). If you own the regular card of a player elected Hero, your card will keep unchanged. If you want the improved purple IF card, you will need to buy the corresponding Hero version in the market or pull it from a pack in that day.